Fantasy 5×5 is a NBA specific set of tools and information for Fanduel, Draftkings and Yahoo! DFS NBA. Injuries Tools – Which players benefit when “x” is injured? 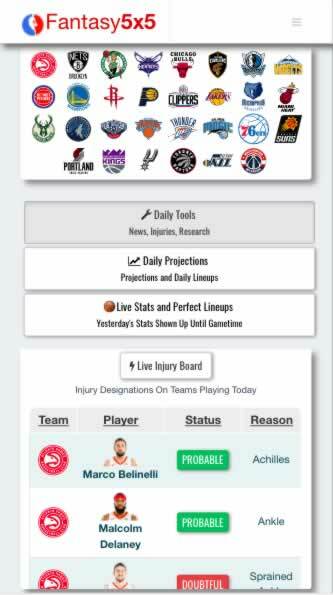 In NBA DFS, injuries are the thing. When an important player is going to miss a game it opens up opportunities for other players on the team. Unlike football where the backup gets the benefits, in NBA it is sometimes the other starters. So, the question the Fantasy5x5 is trying to answer is who benefits when a player is injured? They do that by looking at historic performance (data) and seeing who benefited in the past. Yesterdays Perfect Lineup for DK, FD, Y! Fantasy5x5 offers some tools that I’ve not seen at any of the other DFS sites. Specifically the injury boosts tools and the new DvP Dashboard (defense vs Fantasy points and a ton more). With NBA, injuries are the thing. Here is a quick overview of updates in 2019. Similar to the Injury Boosts, the On/Off chart shows which players are more efficient at scoring FP when their teammate is on/off the court. This can give you insight into who might benefit from an injury even before that player has missed a game. Every NFL DFS player knows that stacking QBs and WRs enhances your upside because you can score fantasy points from each of them on the same play. In the NBA, the only way to achieve this same effect is through finding teammates who have a proclivity to assist each other’s shots. Unfortunately, this data is not reported and practically impossible to find without examining play-by-play data to determine who assisted which shot. Fantasy5x5 does just that and calls these types of players “Assist Buddies”. Putting two teammates in your lineup affects the volatility of that lineup in ways most DFS players are unaware of. Some NBA teammates are more volatile to play together and tend to Boom/Bust together (These are often Assist Buddies), and are great for GPP stacking. Other teammate pairs dampen each other’s volatility – if one has a poor game, the other is likely to pick up the slack, and these are better for cash lineups because they raise your overall floor. Knowing which is which is critical for building successful Cash and GPP lineups. Each of these charts has a corresponding “Boost Tool” on the main homepage/dashboard, which scans the charts and surfaces the top players who are in a uniquely beneficial situation that day (Injury Boosts, On/Off Boosts, Assist Buddies, and Teammate Correlation). Injury boosts – this is one of the prime value adds. Who benefits when a player goes down? For example, when a high scoring player like DeMar DeRozan (who takes 21 shots/game) is out… who gets those shots? Answer -> This Guy. Anyone who plays NBA DFS immediately see the value in that chart (premium feature, and no one else presents the data like this). “X” gets hurt. Player “Y” is likely to get the boost. This is good stuff here folks. Rematch Boosts – shows the average fantasy points this season vs today’s opponent for the players that have a positive correlation boost. Todays Correlation Boosts – Lineups with players who fantasy production correlates increases the line-up’s upside potential. Comes with higher cost of volatility. This tool is designed to make Vegas Over/Unders and Spreads more intuitive and to make finding favorable match-ups really easy. A team’s Vegas Boost is simply a team’s Vegas projected point total compared to the average points that a team scores per game. A team’s fantasy output highly correlates with their point total (.84 correlation in 2016-17 season). Since DFS salaries in NBA are mostly based on past averages, a Vegas boost can clue you in to additional value on a team, regardless of whether they are the favorite or underdog or in a high Over/Under game. Each expected starter’s DvP boost is also shown in this tool. Defense vs Position – reflect the fantasy points given up by a team to each player they have faced, relative to that players typical fantasy production against the rest of the teams. Todays Projected Matchups – Who’s on who? Essentially these keep track of the best possible lineups for the different types of games as well as the best possible lineup. Updated throughout the day. These are all pretty self explanatory except the ‘Real Time Research’. This is a pretty neat tool and essentially it shows you which player profiles are being looked at on Fantasy5x5. If there is someone there who a ton of people are hitting on that wasn’t on your radar, he is now. It’s so you don’t miss any obvious plays. Yes, although this tool is in beta you can utilize it to build optimal lineups. At the time of this review there are still some functions and features missing so for now I will not go in depth. If you want to try it out once you have a premium account it could be well worth it, but the optimizer itself is not the reason people are happily paying $9.99 per month for this service. I like the service. It’s a fraction of the price of the leading competitors and it is tailored to fantasy NBA. I personally do not play NBA but the players over from reddit have seemed to like this product. If you are playing NBA then it is pretty much a no brainer to check it out. You can try it out for $1.99 per day for up to 5 days. If you decide to keep the subscription it applies to your first months fee. Give them a try, visit Fantasy5x5.com. Get 24 hours to use 100% of the tools free. Use it for todays NBA games free with your monthly package.